What will we do for 5 days in London with kids? London is the first stop on our two-week madness adventure to Europe this spring break. It will be me and my 14-year-old’s second trip to London, but for Hubby and the two little ones (8 & 5 years old), their first time. On our last trip, me and my oldest boys took a ride on London’s Ghost Bus, which was my 14-year-old’s favorite activity. This is our family’s thing—cheesy ghost tours. We hit the Ghosts and Graveyards tour in Boston last November, and the boys still cite it as their favorite activity of the trip. We visited The London Dungeon, and the large arcade alongside. Beyond that, we walked around the awesome city at night: Trafalgar Square, Covent Garden (stopped for a fun street show), hit Piccadilly Circus, and spend almost a whole day in the largest book store in Europe. That trip we had only three days. This time we have more time but are still committed to one activity per day, giving us plenty of time for wandering and unplanned adventures. Our trip plans: 4 days/ 3 nights in London—then a weekend in Edinburgh—followed by 2 more days/ 1 night in London before taking the Eurostar to Paris. This is the plan, and we will update on how well the plan works out and what we discovered, changed, or loved shortly. Day 1: Land at Gatwick Airport, London at 8 a.m.
We are taking an overnight flight from the states, and our little guy’s first international flight, so we are uncertain how day one will pan out. To fly out of Boston, we will drive 6 hours from our home in the Adirondacks, making our time in the car nearly as long as our time on the plane. Because of the ride, it will take us a VERY long time to reach London. This could go two way—the kids will either be well rested from sleeping in the car and on the plane, revering to go for the day. Or, it will exhaust them, and we will carry a 5-year-old through London to get to our accommodations. So—we have to wing it here. After landing, we will grab a Travelcard and hop on the Southern Line train to London Bridge, grab a double-decker bus to Tower Monument, and walk to Wombats City Youth Hostel. Youth Hostels with 6-bunk rooms are a perfect choice for a family of six to stay together. We’ve allotted the whole day to see The Tower of London even though we don’t expect to spend all day doing so, but an activity for our second day. The Tower of London offers Family Passes, a great money saver. And if, like us, you use a train to get to London, or a National Rail travelcard, you can take advantage of London’s Day Out 2 for 1 admission. We calculated the cost of the London Pass vs. London Explorer Pass vs. Family Tickets, and for our group in almost every case the 2 for 1 deal was a better value. The one activity rule will give us plenty of time (hopefully) to explore markets, squares in the afternoon and evenings. Yes, a wax museum seemed like an odd choice of tourist attraction to make the top Must-Do lists in London. But after the boys had a blast on an impromptu visit to a much smaller wax museum in Boston last November, it became one of the top things everyone wanted to do—add in a superhero exhibit and the kids insisted—so did Hubby. As with The Tower of London, Madame Tussaud’s offers a family admission, but we used the 2 for 1 deal with VIP access. It didn’t save us any money because we were purchasing a more expensive ticket, but for what it would cost us for regular admission, this affords us a skip-the-line option. Traveling with a group of autistic children who have difficulty waiting made this was a lifesaver. After reading Rick Riordan’s Red Pyramid, my 8-year-old wants to see the Egyptian exhibit and the Rosetta Stone. Fantastic! Best of all, like many museums in London, The British Museum is FREE. I love free, especially for museums where most of the time even the child interested in going is done within an hour. We would love to check Princess Diana’s playground in Kensington Gardens if we can manage it this day. We will see because at 11 pm this evening we have a sleeper train to catch to Scotland. When we return from our weekend in Edinburgh, we have two more days to explore London. We arrive back in London via the Caledonia Sleeper train from Edinburgh at 7:30 am, make our way back to Wombats, and likely do laundry to make it through the second half of our trip to come. We decided not to make any definite plans for this day and use it to do anything we missed or decided we wanted to see throughout our journey—or rest—yeah, right! If the kids are up for it, I’d like to see the changing of the Queens Horse Guards in Hyde Park. Thomas (8) and I watched Paddington Bear 1 and 2 last week, and once I told him there was a tour, he was all-in for the Paddington Bear tour. For this tour, we meet our guide at Paddington Station, take the public buses to places from the two movies, and end in Portobello Road market at the place they base the antique shop in the movie upon. It is early—for us—at 10:30 am, but since this is our last day in London, and our Eurostar doesn’t leave until 7 pm, we wanted to a visit a part of the city we wouldn’t otherwise make it to. I knew I would love to see Portobello Road, and poke around the shops, get a bite to eat, but with the kids and activities to keep them occupied it was unlikely. So the beauty of this tour is its kid-friend and brings Mom and Dad to the market. So there you have it, our London Plans. What are your favorite things to do in London with kids? Anything you must-see or do? Passports and Pushpins is a travel blog that will help you plan vacations and adventures with your kids, and take you along our journey to traveling freedom. 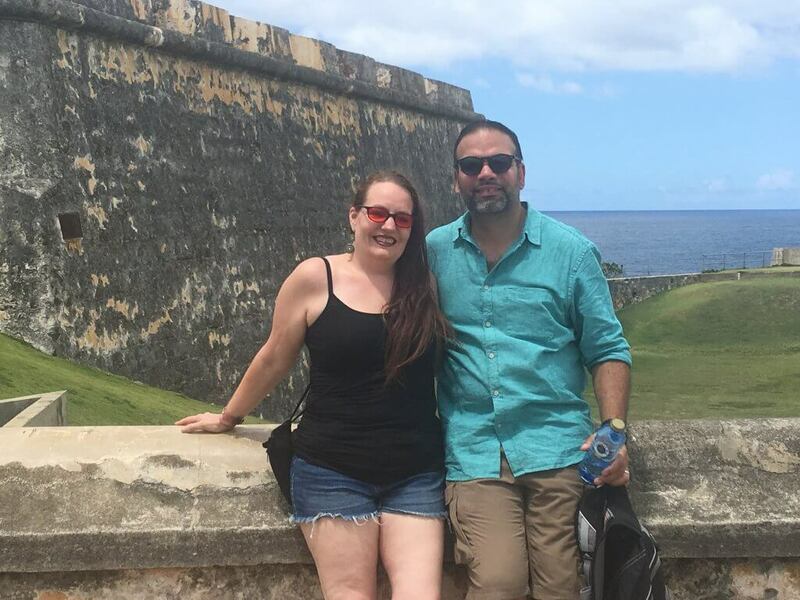 "We visited San Juan last year and fell in love, as well. It's a beautiful old..."
"I really have a thing for old cultural towns. Old San Juan was lovely." Jeannie is Mom to this traveling family, author of Twirling Naked in the Streets and No One Noticed; Growing up with Un-Diagnosed Autism. A writer of Middle-grade novels (focused on monster hunting and weird things—see the World of Weird. She loves the search for totally crazy, real stories, myths, urban legends, and creepy crap in the locations they visit). Currently, Jeannie is working on her MFA at Seton Hill University, Writing Popular Fiction, and the creator of Aspiewriter.com—Understanding Autism from the Inside and Passportsandpushpins.com—Pack up the Kids and Go Traveling. Passports and Pushpins is a participant in the Amazon Services LLC Associates Program, an affiliate advertising program designed to provide a means for sites to earn advertising fees by advertising and linking to Amazon.com. Copywrite 2018 by Passports and Pushpins. All rights reserved.